As world-shattering conflict raged around the skies and swamps of Karda Nui, the noble Toa were faced with a problem. 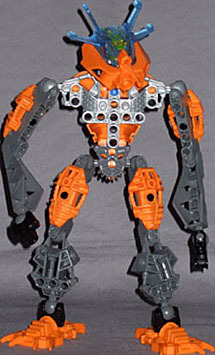 "Hey Tahu," Onua said. "How can we make more money?" "Dunno," Tahu shrugged, as best he could with single-point shoulder articulation. "We've already sold toys of all of ourselves several times over. If only we had vehicles like Vultraz and Mazeka." "According to the ancient tomes," Gali observed, "an Earth creature named George Lucas is the master of merchandising. Whenever he runs out of things to sell, he just invents more." "Hey, look," Pohatu exclaimed, tripping over several large boxes with price tags attached. "A bunch of vehicles!" Packed with power, the Rockoh T3 can trap enemy ships in an energy field or ram them out of the sky! I'm not complaining, I'm just saying that's how it happens - and yes, the Toa Nuva really did just stumble across a bunch of vehicles lying about the place, with their names (and age requirements, probably) inscribed on the ground in front of them. Pohatu evidently got punished for clumsily drawing attention to the obvious plot device, so he got the smallest of the pack. Mind you, "small" is a relative term, and the jump from 1½"-tall Lego minifigures to 9" Toa is a significant one. Likewise 390 pieces may not sound like a very large Lego kit, but half of them are sizeable Technic bits and chunks of Bionicle armour, so the Rockoh measures 16" from stem to stern. Living up to its name (assuming it's meant to be what it sounds like), it's a solid, heavyweight-looking thing, a reinforced ramming machine that looks like it'd be a lot happier if projectile weapons had never been invented, and all combat was solved by brute physical force. All of the T-series vehicles are built with handles, so you can pick them up and zoom them around easily without worrying about whether you're holding a load-bearing structure or not - and, if you're dealing with militarily-minded children (and they all are, pretty much), it also means the vehicles can pull double duty as crazy sci-fi guns. At rest, the Rockoh sits on this handle and on a claw structure further back beneath the saddle, keeping its nose up in the air slightly - it makes for a good display piece. In action the handle is positioned perfectly for weight distribution, forward of the join between the bulky front and the slimmer rear, and the trigger for the main gun sticks out sideways just above it, to be operated by the other hand. The gun, ensconced deep within the main hull, is another of those not-really-Midak skyblasters, like Mazeka's swamp strider had - it's not the same Midak piece as the hand-held version the Toa get, but it works by the same principle, a claw holding the sphere ammunition, which is pressed on from behind by a rod (in this case connected to the trigger lever), which eventually overcomes the claw's resistance and sends the sphere flying. The "barrel" of the Midak emerges beneath the forward armour; atop the armoured section is the entry point for the magazine, which runs through the middle of the vehicle and has a five sphere capacity, not counting the one sitting in the claw. The magazine also has a catch added to the top of it, so the spheres won't fall out when they're upside-down if you pull a barrel roll. 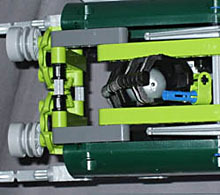 For added imaginary violence, a pair of wing pieces swivel out and down from atop the main hull, revealing laser blasters - which are notable in that they use standard Lego parts, not Technic or Bionicle ones. Elastic bands inside the hull hold the wings gently, so that they'll slide either towards fully closed or fully open depending on which side of their mid-point they are, and the pair are geared together for simultaneous operation, and they're controlled by a swivel knob that comes out beneath the engine exhaust at the back. Speaking of the rear, sitting just in front of the exhaust is the saddle where Toa Pohatu sits, locked in place by pegs his hands attach to on the handlebars, and a rod that runs beneath the saddle and plugs into his ankles. 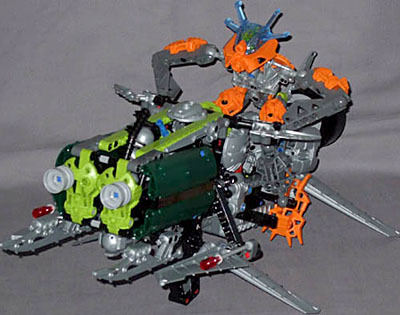 With the reliably sturdy joints of a Bionicle figure, it's no trouble to get Pohatu into a cool-looking riding pose that he'll stay in no matter how the vehicle gets jerked about. The Toa Nuva (at least by this stage - I don't know if it was always the case) have "adaptive armour," which means that whatever they're up to, their bodies appear to reconfigure themselves to suit it. Thus Pohatu has lost his extra shoulder pieces, making him slimmer and less stocky-looking than his ground-pounder form, and of course he's got hands instead of insane blades of death, which would be difficult to shift gears and work the turn signals with. The clear shell within his mask has sprouted fins - you'd think that'd be a hindrance, if he wanted to look around while flying, but I guess the armour knows what it's doing - and since he'll be spending most of his time hunkered down with his belly against the vehicle, his torso and bicep armour has moved to cover his back instead of his front. Mind you, if the armour was really adaptive, it would've changed colour - orange plus green, I can't bring myself to agree on that one. Poor fashion regardless, though, I like the Rockoh - it's not especially expensive, it's a fun and fairly involved build, and it's got a neat array of tricks to keep the kids entertained once they've finished putting it together. Its best feature, though, is simply that it looks badass, and you can easily imagine it smashing gorily through the ranks of the aerial Makuta.